We are having our next Stratodesk software webinar on May 2, 2019 at 8:30 a.m. PT. 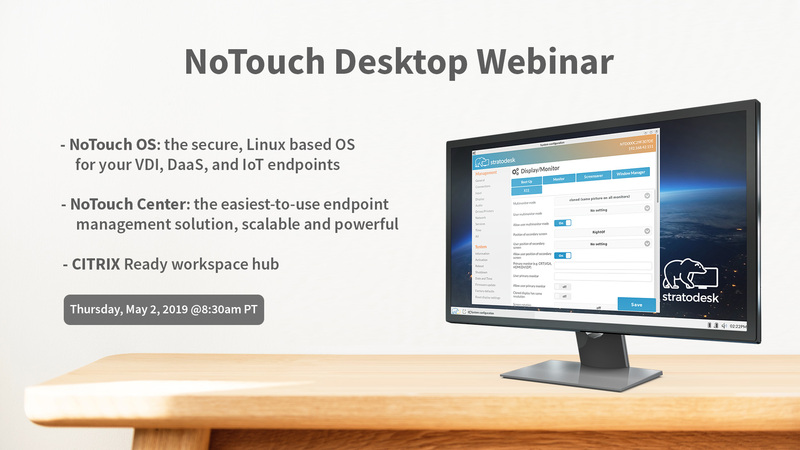 Our webinars are a great opportunity for existing and potential customers to get an inside look at what makes NoTouch the #1 choice for VDI, DaaS and IoT deployments. Experience enterprise grade management and learn why government and healthcare organizations, banks, armed forces, small/medium sized businesses and large enterprises in North America and around the world choose Stratodesk to power and manage their entire network of endpoint devices. NoTouch OS is the Linux based, minimal footprint OS for your VDI, DaaS and IoT endpoints. Easily deploy NoTouch OS with one of our multiple boot options. Replace Windows on endpoints or run NoTouch side-by-side Windows to enable BYOD deployments. Able to power almost any x86 and Raspberry Pi device. We will also be providing a live demo of NoTouch Center and giving you an in depth look at how this advanced management solution automates management processes saving you time and money. Manage thousands of devices from one easy-to-use management center. By supporting inheritance of settings, groups can be easily set, configured and synced. Take advantage of advanced features including: multiple user roles, monitoring, asset management/inventory, Helpdesk and many more that you would expect from an enterprise grade solution. In addition, NoTouch Center is the only endpoint management solution able to run on premises or in the Cloud, making it ideal for both VDI and DaaS deployments. The Citrix Ready workspace hub is the next generation endpoint available from NComputing and ViewSonic, and pioneered by Stratodesk. Our OS runs on the device directly out-of-the-box and easily connects to your Citrix VDI and NoTouch Center. The workspace hub also comes complete with advanced and exclusive features including Citrix Casting. We look forward to seeing you at the webinar. Reserve your spot by following the link below!